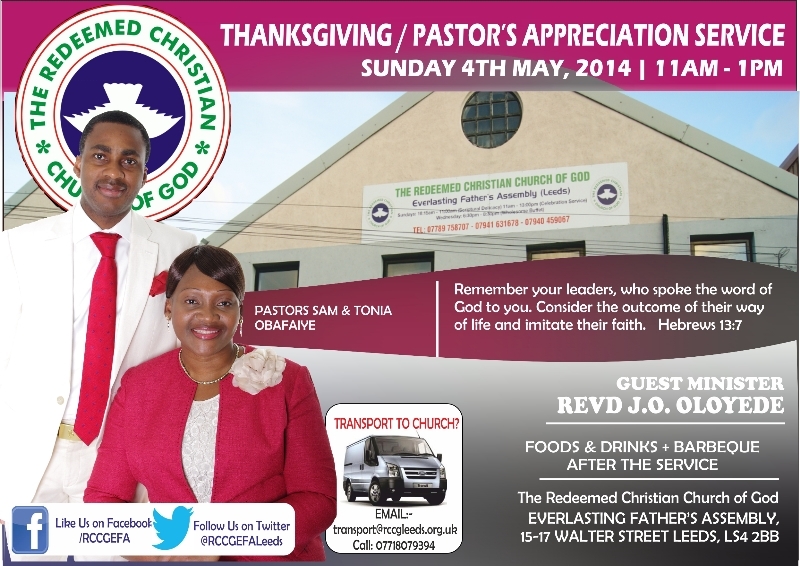 Dear <<First Name>>, you are invited to our May Thanksgiving/Pastor's Appreciation Service. Please come and join us in showing appreciation to our Pastors - Samuel & Anthonia OBAFAIYE. Please type http://www.facebook.com/RCCGEFA into your browser or click the URL. The Church Facebook Page will come up. Please make sure you are signed in to your Facebook account. Then click LIKE button our Page. This will turn to LIKED. This means you are connected to us and can see and SHARE the church's updates, news and posts. Please go a step further in the next button and click Follow. By this you will not miss out on any of our updates. Type this http://www.twitter.com/RCCGEFALeeds into your browser. The Church Twitter Profile will come up. Then CLICK FOLLOW RCCG (EFA) LEEDS. We will automatically follow you too. And also visit our channel on YouTube. Copyright Â© 2014 RCCG Everlasting Father's Assembly, Leeds, All rights reserved.